A swift glance at the UK poster for Brad Furman thriller Runner Runner (2013) – with its triumvirate of ridiculously good-looking stars, air-brushed to glimmering perfection – offers the perfect summary of the film itself. It’s a glossy, well-shot potboiler which is occasionally preposterous (the initial narrative drive hinges on some pretty stupid choices by Justin Timberlake’s lead character), yet functions perfectly well as fun, undemanding Friday night popcorn fare. Richie Furst (Timberlake) is a post-grad Princeton student trying to claw his way back to the top of the financial world after an unsatisfactory stint on Wall Street. Attempting to bolster his meagre tuition money by playing online poker, he is cheated out of all his funds and almost immediately puts into action an improbable plan of seeking a refund. This means jetting off to Costa Rica to confront the site’s owner, Ivan Block (new Batman Ben Affleck) – a poker-faced, no-nonsense businessman who lives a wildly opulent lifestyle. Ivan is impressed by Furst’s honesty and gumption, settling the cash issue and offering him a position as part of his ‘team’ (which also includes old flame turned personal secretary, Gemma Arterton). Furst takes to his new life like a proverbial duck to water, but matters become complicated when the FBI intervene (headed by a fast-talking Anthony Mackie). 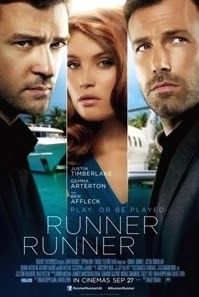 Written by Rounders scribes Brian Koppelman and David Levien, Runner Runner finds the duo reworking similar themes found in that 1998 feature, but on a much broader canvas this time around. There’s some moments which reverberate with the real-world (Block’s Ponzi-like scheme of skimming from his online customers) but mostly they just settle for a pulpy depiction of greed and corruption. Performance-wise, Timberlake does an adequate job, if bringing little personality to the role. Affleck, however, is really fun here, underplaying it nicely as the steely-eyed, sun-baked bad guy. He doesn’t have to do much to muster the requisite menace. Managing to hold her own with her male co-stars, Arterton’s part is tragically underwritten, and she sometimes struggles to rise above her arm-candy archetype. Those well-tread suspense machinations kick in during the latter half of the film, but the film never descends into violence and bloodshed for the sake of it, and at a well-paced and brisk 90 minutes, it doesn’t outstay its welcome, either. Runner Runner is a slick, daft and unabashedly entertaining Hollywood thriller. It doesn’t do anything new with the formula, but it knows how to engineer it in the correct way.